[S70] Unknown record type, unknown repository address, Iowa 1870 Federal Census, pp. 129, WP 13. [S119] Mary Lovering Holman assisted by Caroline Clement Brown, Clement Genealogy, p. 736. [S79] Paul Volppe, "Birth Record," e-mail to Mildred Andorfer, January, 2000, Dan Whipple e-mail address; 26 Feb 2002. [S70] Unknown record type, unknown repository address, Iowa, Mitchell County, Cedar Township, p. 15, Line 12, Dwelling 99, Family 99, Ancestry.com image, Nov 2003. [S92] Unknown record type, unknown repository address, FHL Film 1255422, National Archives film T9-1427, p 220A; Medina, Dane County, Wisconsin. [S70] Unknown record type, unknown repository address, 1870 U.S. Census, p. 17, Dwelling 119, Family 118; Wisconsin State Historical Society Library, Madison, Wisconsin. [S14] Twelfth Census of the United States, Kansas, Saline County, Dayton Township; SD# 5, ED# 113, Sheet No. 9A, Image 114, Dwelling 155, Family 156; Ancestry.com image. [S70] Unknown record type, unknown repository address, 1870 U.S. Census, p. 17, Dwelling 119, Family 118; Wisconsin State Historical Society Library, Madison, Wisconsin FHL Film No. 295479, p. 131. [S92] Unknown record type, unknown repository address, Kansas, Saline County, Dayton Township, SD# 3, ED# 292, Page No. 16, Dwelling 132, Family 132; Ancestry.com image 396 (Listed in household with Elizabeth TORGLER, Aged 53, as Head (Keeps House), sons John (26) and Fredrick (20), Daughter Louisa (18), BUGHER, Martha E. (Age 4/12) Jobs niece?, and CARTER, Nathaniel (Age 48) Hired man. [S86] Robert Gerick, 05 Aug 2000 to Mildred E. Andorfer, Family Group Sheet; 31 May 2001. [S71] Unknown author, "Family Group Sheet", Robert Gerick, 31 May 2001. [S79] Paul Volppe, "Birth Record," e-mail to Mildred Andorfer, January, 2000, Kathy Pike, 14 Jun 2001. [S75] Unknown author, "E-mail," e-mail to unknown recipient, Sheila Bleay 22 Jul 2001; e-mail address. [S75] Unknown author, "E-mail," e-mail to unknown recipient, Jackie Knecht; 17 Jul 2001. �����Ann (?) Rolfe married Edward Rolfe, son of Thomas Rolfe and Anne (?) Rolfe, after 1774 at Feltwell, County Norfolk, England.1,2 As of after 1774,her married name was Rolfe. Ann (?) Rolfe died deceased. [S53] International Genealogical Index (IGI), Film No. 446244, page No. 18. [S92] Unknown record type, unknown repository address, Windsor Township, Dane County, Wisconsin; age 70. [S119] Mary Lovering Holman assisted by Caroline Clement Brown, Clement Genealogy, p. 574. [S119] Mary Lovering Holman assisted by Caroline Clement Brown, Clement Genealogy, p. 394. [S77] Austin "Gus" Sexton, 27 Feb 2000, www.sun-prairie.com/museum.htm; City of Sun Prairie Historical Library and Museum Death List; p. 44; 06 Feb 2002. [S119] Mary Lovering Holman assisted by Caroline Clement Brown, Clement Genealogy, p. 575. [S124] Unknown agency, Biographical Review of Dane County Wisconsin, p. 1132; Wisconsin Historical Library, Madison, WI; 19 Mar 2002. [S92] Unknown record type, unknown repository address, Windsor Township, Dane County, Wisconsin; age 74. [S75] Unknown author, "E-mail," e-mail to unknown recipient, Dan Whipple; 15 Jul 2001. [S113] Unknown record type, unknown repository address, p 388. [S9] Unknown record type, unknown repository address, p. 212. [S70] Unknown record type, unknown repository address, p. 683. [S92] Unknown record type, unknown repository address, FHL Film 1255422, National Archives film T9-1427, p 420B; Windsor, Dane County, Wisconsin. [S17] Death Record - Local, Pre-1907 Wisconsin Deaths, Dane County, Vol 1, Page 168, No. 571, Image No. 717; State Historical Library 12 Mar 2002. [S17] Death Record - Local, Register of Deeds, City-County Building, Madison, WI; Deaths Vol 2, p. 136 #571. Children of Lydia Sweetland Stephenson and James Guppy Clements Esq. 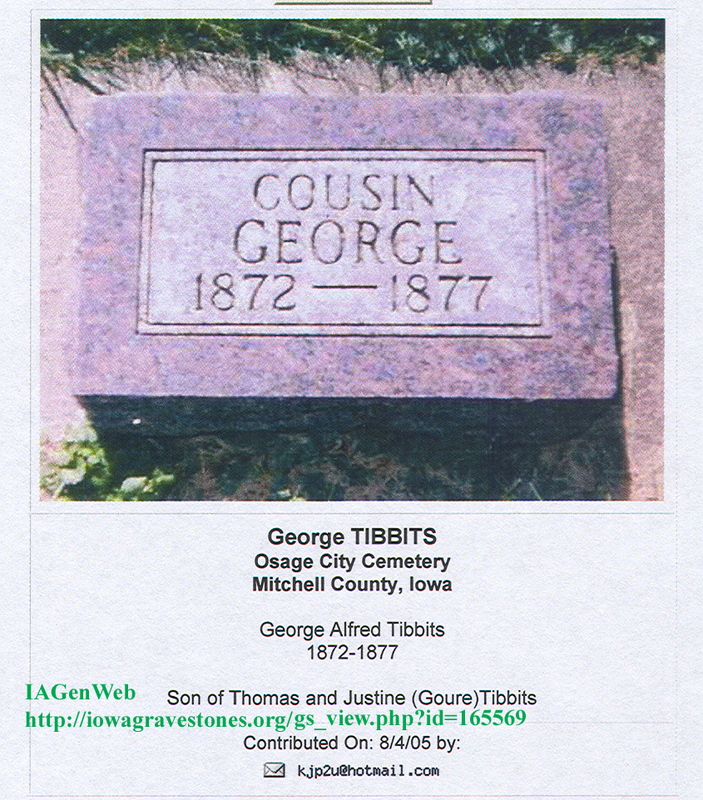 [S2] Death - Obituary, for his father, Thomas T. TIBBITS. [S2] Death - Obituary, for father, Thomas T. TIBBITS. [S91] Unknown record type, unknown repository address, Hilgay, Norfolk, England; H.O. 107/1830. [S83] Unknown name of person unknown record type, unknown repository, unknown repository address, Prairie Cemetery Lot 36-3, Mt. Ida/Fennimore, Grant County, WI; research done 29 Apr 2002. [S1] Unknown compiler address, Birth Record: Norfolk Record Office, Norwich, Norfolk County, England; FHL Film No. 2186545, Iterm 14, Register of Baptisms in the Parish of Hilgay 1813-1835, p. 97, No. 776. [S109] 1841 Census, FHL Film No. 438849, British Film No. 107754, p. 17. [S17] Death Record - Local, SHSW film; Pre 1907 Wisconsin Death Records; Grant County, Vol 2, p. 437. [S70] Unknown record type, unknown repository address, Wisconsin, Grant County, Mount Hope, FHL Film No. 295693, p. 313. [S92] Unknown record type, unknown repository address, FHL Film 1255427, National Archives film T9-1427, p 404C; Woodman, Grant County, Wisconsin. [S98] Unknown record type, unknown repository address, Wisconsin, Dane County, Westport Township, SD# 2, ED# 98, Sheet 7A, Line 23; Ancestry.com image 27 Feb 2003. [S83] Unknown name of person unknown record type, unknown repository, unknown repository address, Prairie Cemetery, Mt. Ida/Fennimore, Grant County, WI; research done 29 Apr 2002. [S7] Death Record - Local: SHSW film Pre 1907 Marriages, Grant County, Vol 6, p. 21. [S92] Unknown record type, unknown repository address, FHL Film 1255427, National Archives film T9-1427, p 250A; Mount Hope, Grant County, Wisconsin. [S17] Death Record - Local, Grant County Courthouse, Lancaster, Wisconsin; Deaths Vol 4, p. 97, No. 147; research done 29 Apr 2002. [S76] Unknown record type, unknown repository address, Full Context of American Civil War Soldiers; 01 May 2002. [S17] Death Record - Local, SHSW film; Pre 1907 Wisconsin Death Records; Reel 031, Image 1555, Sequence # 265720; Grant County, Vol 2, p. 437. [S101] Helen Hinman Dwelle Chapter, Sunset Rest Cemetery Records, Prairie Cemetery Lot 36-3, Fennimore, Wisconsin; 29 Apr 2002. �����Laura Morden was born on 13 January 1886 at Mt. Hope, Grant county, Wisconsin.1,2 She was the daughter of Anthony J. Morden and Jane Elizabeth White. Laura Morden married Walter R. Pease, son of William E. Pease and Jane A. (?) Pease, on 31 August 1904 at at the residence of Otis Russell, Woodman Township, Grant County, Wisconsin; Methodist ceremony with Jerome Perry, Justice of the Peace.3,4 As of 31 August 1904,her married name was Pease (Morden). [S1] Unknown compiler address, Birth Record: SHSW film Pre 1907 Wisconsin Births, Vol 72, p 2497. [S5] Unknown subject entry, unknown record type, Grant County Courthouse, Lancaster, Wisconsin; Birth Vol 5 p. 257 No. 77; research done 29 Apr 2002. [S7] Birth Record: SHSW film Pre 1907 Marriages, Grant County, Vol 8, p. 509. [S7] Birth Record: Grant County Courthouse, Lancaster, Wisconsin; Marriage Vol 13, p. 220, No. 169; research done 29 Apr 2002. [S1] Unknown compiler address, Birth Record: SHSW film Pre 1907 Wisconsin Marriages, Vol 8, p 509. [S5] Unknown subject entry, unknown record type, Grant County Courthouse, Lancaster, Wisconsin; Birth Vol 4 p. 37 No. 181; research done 29 Apr 2002. [S7] Birth Record: SHSW film Pre 1907 Marriages, Grant County, Vol 6, p. 21. [S7] Birth Record: Grant County Courthouse, Lancaster, Wisconsin; Marriage Vol 13, p. 310, No. 223; research done 29 Apr 2002. [S7] Ancestry World Tree Search Results: Grant County Courthouse, Lancaster, Wisconsin; Marriage Vol ? ?, p. ?? ?, No. ??? ; research done 29 Apr 2002. �����Jane Elizabeth White was born in 1861 at Wisconsin; calculated from year of birth on 1880 Federal census.2 She was the daughter of William White and Mary (?) White. Jane Elizabeth White married Anthony J. Morden, son of David Morden and Ann Carter, on 6 May 1878 at Woodman, Grant county, Wisconsin.1 As of 6 May 1878,her married name was Morden (White). Jane Elizabeth White appeared on the census of 1880 at Mount Hope, Grant County, Wisconsin; Jane MORDEN, Wife, Female, Married, White, Age 19, born in Wisconsin, father born in Scotland, mother born in England.3 As of 13 January 1886, Jane Elizabeth White was also known as Jennie White.4 She and Anthony J. Morden celebrated their 17th wedding anniversary with A. J. 's parents, Ann (Carter) and David MORDEN, who celebrated their 40th wedding anniversary on the same day. on 6 May 1895 at Fennimore, Grant County, Wisconsin. [S7] Ancestry World Tree Search Results: SHSW film Pre 1907 Marriages, Grant County, Vol 6, p. 21. [S7] Ancestry World Tree Search Results: SHSW film Pre 1907 Marriages, Grant County, Vol 8, p. 211. [S7] Ancestry World Tree Search Results: SHSW film Pre 1907 Marriages, Grant County, Vol 8, p. 509. [S5] Unknown subject entry, unknown record type, Grant County Courthouse, Lancaster, Wisconsin; Birth Vol 5 p. 254, No. 522; research done 29 Apr 2002. �����Jane A. (?) Pease married William E. Pease.1 Her married name was Pease. �����Maggie F. Loomis was born at Grant County, Wisconsin.1 She was the daughter of Truman Loomis and Harriet (?) Loomis.1 Maggie F. Loomis married John David Morden, son of Anthony J. Morden and Jane Elizabeth White, on 5 November 1898 at Boscobel, Grant County, Wisconsin; statutory ceremony officiated by J. McLaughlin, witnesses were Anthony MORDEN and Jane MORDEN.1 As of 5 November 1898,her married name was Morden (Loomis). �����Truman Loomis married Harriet (?) Loomis. �����Harriet (?) Loomis married Truman Loomis. Her married name was Loomis. [S7] Ancestry World Tree Search Results: Grant County Courthouse, Lancaster, Wisconsin; Marriage Vol 10, p. 174, No. 106; research done 29 Apr 2002. [S7] Ancestry World Tree Search Results: Grant County, Wisconsin Marriage Records, Vol 1, p.116. [S71] Unknown author, "Family Group Sheet", Larry Shoger, June, 2000;. [S7] Ancestry World Tree Search Results: Grant County Courthouse, Lancaster, Wisconsin; Marriage Vol 8, p. 72, No. 213; research done 29 Apr 2002. [S7] Ancestry World Tree Search Results: SHSW film Pre 1907 Marriages, Grant County, Vol 5, p. 496. [S17] Death Record - Local, SHSW Library Pre-1907 Death Records Film, Grant County, Wisconsin; Vol 2, p. 196. �����Elizabeth (Lizzie) Woodward was born in 1855; birth year calculated from age on 1860 census.3 She was the daughter of Edward Woodward and Sarah Hicke.2,1 Elizabeth (Lizzie) Woodward appeared on the census of 30 June 1860 at Lima, Grant County, Wisconsin; Elizabeth WOODWARD; Age 5, Female, born in Wis. Attended school within year.3 She married Frank Pegg, son of Richard Pegg Sr. and Mary Carter, on 16 October 1877 at Platteville, Grant County, Wisconsin.1,4 As of 16 October 1877,her married name was Pegg (Woodward). Elizabeth (Lizzie) Woodward married William Martell on 3 May 1891 at Lima, Grant County, Wisconsin.2 As of 3 May 1891,her married name was Martell (Woodward). [S7] Death Record - Local: SHSW film Pre 1907 Marriages, Grant County, Vol 5, p. 496. [S7] Death Record - Local: SHSW film Pre 1907 Marriages, Grant County, Vol 7, p. 224. [S9] Unknown record type, unknown repository address, Town of Lima, Grant County, Wisconsin; p. 48, Line 3. [S7] Death Record - Local: Grant County Courthouse, Lancaster, Wisconsin; Marriage Vol 8, p. 72, No. 213; research done 29 Apr 2002. [S9] Unknown record type, unknown repository address, Town of Lima, Grant County, Wisconsin; p. 47, Line 39. [S9] Unknown record type, unknown repository address, Town of Lima, Grant County, Wisconsin; p. 47, Line 40.